This is everything the name suggests! 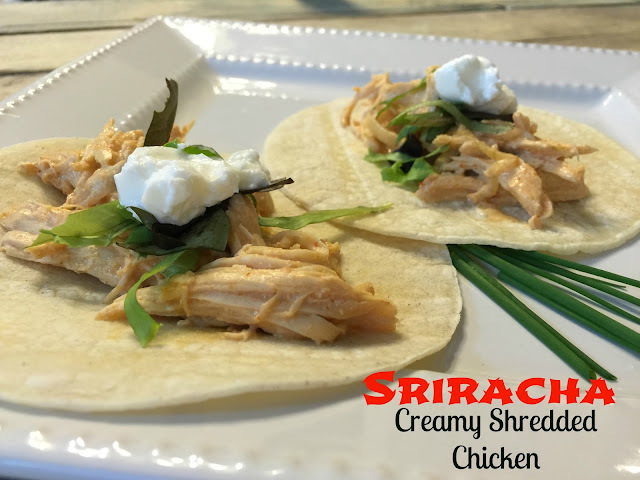 It's spicy from the Sriracha, it's creamy from the cream cheese and you shred it when it's done cooking ;) Not only does this taste delicious, but the recipe only contains 4 ingredients and is STILL delicious! That's not an easy task, so this is a keep folks! This would be a great recipe for those days where you seriously don't have time to fuss over dinner! You will see below I used my chicken breasts and cream cheese frozen. They cook up nicely that way as long as they're not too thick or they don't reach the proper temperature in time. I buy cream cheese when it's on sale and freeze it for future use. So, go grab these few ingredients and get crockin'! Place the chicken into the bottom of your crock and top it with the onions. Pour the sriracha sauce over the top and add in the block of cream cheese. If you're cooking your chicken FROZEN, cook on HIGH for 4 hours or LOW for 8 hours. If you're cooking fresh thawed chicken, cook on HIGH for 2.5-3 hours or LOW for 5-6 hours. Shred the chicken between two forks, then stir back through sauce in the crock. Serve any way you choose and ENJOY! Over the past couple of days, I've served this a few different ways. The first way I served this was on GF white corn tortillas with some shredded lettuce and non-fat plain Greek yogurt in place of sour cream. For the kids, I served this as quesadillas! I heated up the shells with mozzarella cheese and the shredded chicken. I also served just the chicken in a bowl with some shredded mozzarella, shredded lettuce and some non-fat plain Greek yogurt! This would be great over salad or on nachos or in crunchy taco shells as well! Get creative!